Tis the season! Well, for anything pumpkin-spiced, cinnamon-spiced, & nutmeg-spiced, that is. The “basic white girl” is coming out of us full force this Halloween season, but instead of pumpkin-spiced lattes, we’re bringing you something even better… OVERNIGHT OATS! Overnight oats have become a serious foodie trend recently and we’re right on board. This simple, healthy breakfast has become our savior because like many of you, we don’t have the time in the morning to sit down and eat a fully cooked meal. But, we can’t forget that breakfast is the most important meal of the day, so we’ve converted to overnight oats fanatics! 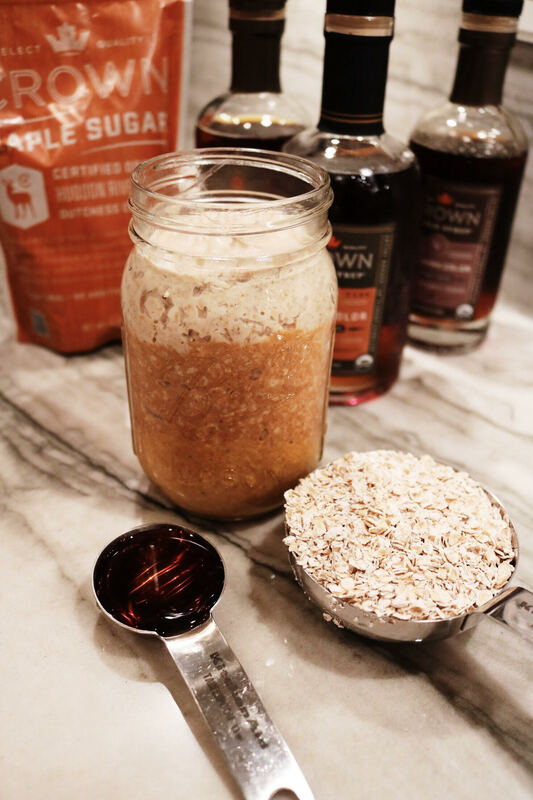 In the height of fall, we’ve partnered up with Crown Maple to show off our favorite, Halloween-themed overnight oats recipe. Crown Maple makes organic, 100% pure maple syrup and maple sugar, which are the perfect ingredients to sweeten up your newfound favorite breakfast! Organic maple syrup is a wonderful vegan sweetener and maple sugar is an amazing alternative to granulated sugars. This 3-layered recipe is our seasonal speciality. Whip up a huge bowl of it to bring to a Halloween party! Combine each layer in a separate cup (double/triple the quantities if you are making it for more than one person). Cover with a lid or Seran wrap and refrigerate overnight. The following morning, place each layer in one jar, starting with the yellow layer, orange, and then white. Add toppings like almond butter, coconut flakes, or more Crown Maple Syrup and enjoy! Bon appétit! We hope you enjoyed this Halloween-inspired healthy treat. Thank you to Crown Maple for sharing your delicious maple syrup with us for this recipe!